WVU students learned their residency placement fates during the 2019 Match Day Ceremony Friday, March 15. 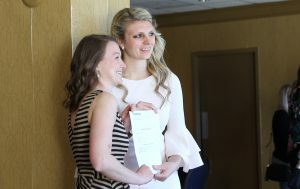 MORGANTOWN, W.Va. — They might be practicing in state-of-the-art hospitals or using the latest digital charting software, but for West Virginia University School of Medicine fourth-year students, it’s an old-fashioned white envelope that sealed their residency placement fates during Friday’s Match Day events. For students, the Residency Match process begins in the final year of medical school, when they apply to the residency training programs and specialties of their choice. Following interviews at programs across the country, applicants and program directors rank each other in order of preference and submit those lists to the National Resident Matching Program, which processes them using a computerized mathematical algorithm to “match” them. • Students placed in 18 different specialty training programs across 20 states. • Fifty-five percent of students matched in primary care specialties. Internal medicine and pediatrics were the top two specialties for the Class. • Forty-eight percent of the class will remain in West Virginia to complete their residencies. “For this cohort in particular, these students – whether native West Virginians or Mountaineers by choice – have demonstrated a deep commitment to the health and wellness of the state in their selection,” Dr. Norman Ferrari, vice dean for education and academic affairs and chair of the WVU Department of Medical Education. The 2019 Residency Match is the largest in the program’s history, exceeding the more than 43,000 applicants who registered for the 2018 Match and the more than 33,000 positions offered last year. WVU has the largest number of graduate medical education offerings in the state, with more than 50 specialty training programs, all of which are fully accredited. One-half of those training programs are the only such specialty programs offered in the entire state. Residency training begins at WVU in July for residents from medical schools across the country. The WVU School of Medicine’s medical degree commencement ceremonies take place on Friday, May 10, at 7 p.m. at the Creative Arts Center in Morgantown.